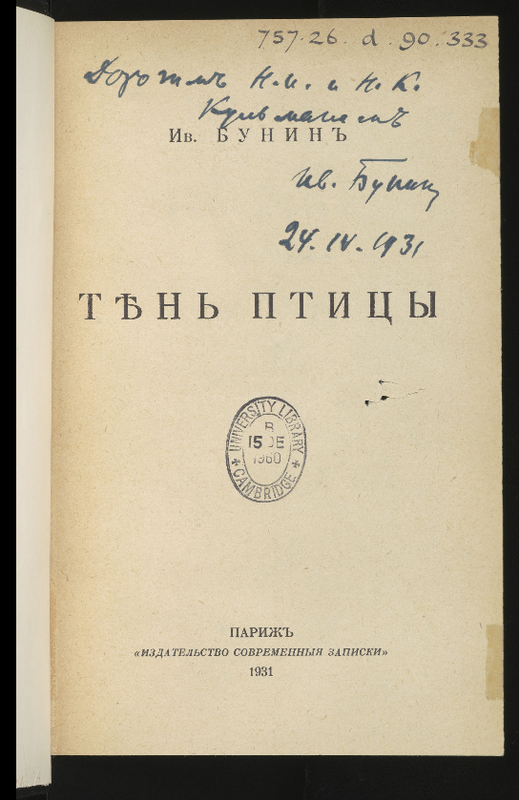 First editions signed and dedicated by Russia’s first Nobel Prize in Literature winner, Ivan Bunin, have been made available to all in a virtual exhibition – after decades spent unrecognised among the open shelving. The books are also on temporary display in the Entrance Hall of the University Library until Friday 30 November. Bunin’s 1933 Nobel citation said the Prize was awarded: “for the strict artistry with which he has carried on the classical Russian traditions in prose writing.” A celebrated prose writer and poet in pre-revolutionary Russia, in 1918 he fled to France where he created most of his masterpieces. Regarded as the émigré master of Russian literature, he was published widely both in Stalin’s USSR and abroad. The Bunin books are part of an exhibition, Out of the Shadows: post 1917 Russian emigration rediscovered, by Vera Tsareva-Brauner of the University's Slavonic Studies Section. The exhibition marks the centenary of the start of the Russian Exodus, when, following the revolutions of 1917, as many as three million people fled their native land, among them many of the best representatives of early 20th-century Russian culture. Most of the émigrés, including the writers Ivan Bunin, Aleksei Tolstoi and Nadezhda Teffi fled to Western Europe, where their determination to preserve their cultural heritage saw the effective creation of a Russia abroad. The books, which have never before been shown, have original autographs by Bunin, Teffi, and Tolstoi. Mel Bach, the Library’s Slavonic Specialist, said: “Many Slavonic literature and history books dating back to 1900 currently remain on the open shelves and there is sometimes much that we don’t know about the books and their provenance. Vera found a book that was signed by Bunin which had apparently never been taken out in its many years at the UL and was largely unknown to library staff here. Two of the books on display in the Entrance Hall are first editions of Bunin’s works with dedications to the Kul’mans. (Mitina liubov’ (Mitia’s love) was inscribed to the couple on 30 December 1925. The second dedication to the Kul’mans by Bunin is found in a first edition of his Ten’ ptitsy (Shadow of a bird), or Tien’ ptitsy using pre-Soviet orthography as in this edition (standard in the early Russian émigré community). Nikolai Karlovich and Natal’ia Ivanovna Kul’man were close friends of Bunin and his wife Vera for over 50 years and often acted as the first readers and editors of Bunin’s works. When Bunin was awarded the Nobel Prize, it was Nikolai Kul’man who Bunin appointed to be the financial executor of the prize money. Kul’man dedicated his life to preserving the Russian language and culture abroad and yet his and his wife’s names have been almost forgotten. Work is underway to research and translate the large corpus of Kul’man-Bunin correspondence held in the Leeds Russian Archive.